Valentine’s Day is closer than you think! Need a couple of new ideas for your Sweetheart? If naming a cockroach after your sweetheart is just not your thing, what about a hot new trend that is happening right now? Colorfuze Succulents! Infusing our orchids was just not enough for us. We’ve gone as far as Colorfuzing our succulents! We are having fun with plants! You’ve got red, golds, blues, silvers, purples and pinks! Pink is Perfect for Valentine’s day! We have a color that is perfect for each holiday and season. Why Colorfuze the succulents? Well, why not? Remember growing up when shoes were dyed different colors to match dresses? Flowers back then were sprayed to match certain events as well. It’s the old adage of where “ everything old is new again.” The paint is non-toxic and does not harm the plant. You’ll even notice the succulent growing! 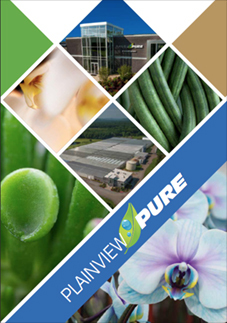 If your sweetheart is more of a natural type, Pure Succulents is the way to go. Ladies, even your man will love to create a succulent garden. Why not surprise him with a few Colorfuze and Pure Succulents to brighten his day. 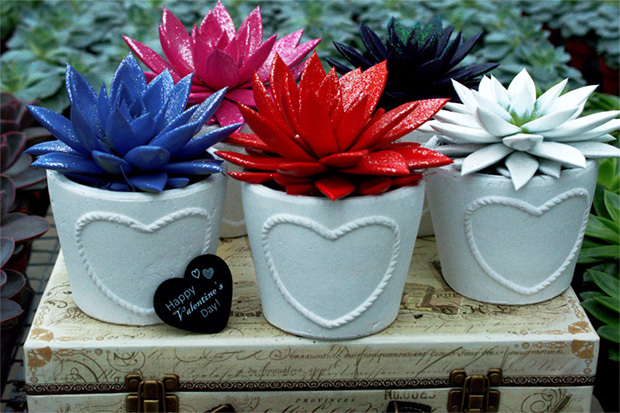 Whether you’re buying a succulent for your sweetheart or simply buying one for yourself , we hope you enjoy your Valentine’Day. I’ve seen these before they are fucked up. Somebody literally just spray paints the plants. They won’t survive. Just get a plastic one if you want unnatural colors.